Tens of thousands of people have already been evacuated from Mexico as Patricia, the strongest hurricane ever recorded in the Western Hemisphere closes in on the coast. Today, Patricia became the strongest storm ever measured on the planet’s Western Hemisphere, threatening catastrophic damage. The hurricane center described the storm was described as the most powerful ever recorded in the eastern Pacific or Atlantic basins, and powerful winds and torrential rain could easily transform into life-threatening flash flooding, and dangerous, destructive storm surge. 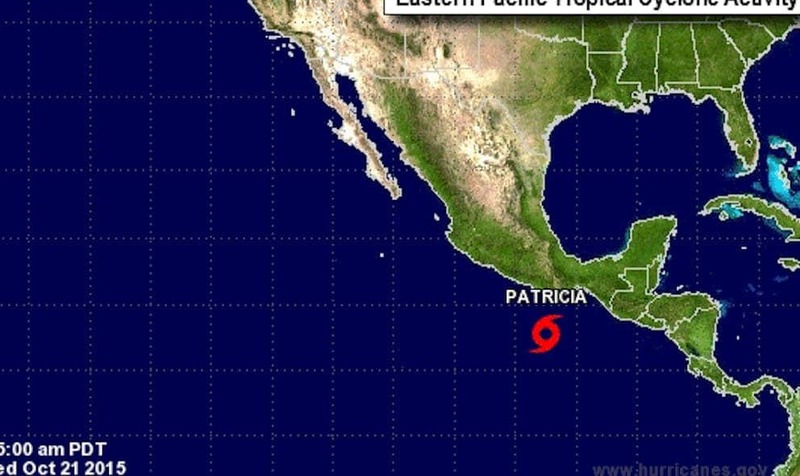 NBC News meteorologist Bill Karins warned that Patricia would be “the most devastating storm to ever hit Mexico”, while Stephanie Abrams, American television meteorologist, currently working for The Weather Channel warned of speeds up to 205 miles per hour (330 km/h). Mexican officials declared a state of emergency in dozens of coastal towns, and everyone is doing the best they can to limit the extent of the damage. “This is an extremely dangerous, potentially catastrophic hurricane,” hurricane center spokesman Dennis Feltgen said. We’ll keep you posted with developments.